A buzz was in the air, excited chattering, the evening waiting to be unfolded into an extravaganza of Crystal Couture at its best. I am sure that must be how the SWAROVSKI Couturier Weekend was like, alas I missed it. That didn't hold me back, no. I still observed the creations and finally put together (after a whole week of drooling) my favorite pieces of one of the best events, or so I feel, of 2015 in Pakistan. There is something really magical about crystals, it makes me happy and tingly all over. The romance that glitters through every tiny piece, breaking light into a million colors, making it dance like a sky lit up with Aurora Borealis. Dreamy isn't it? 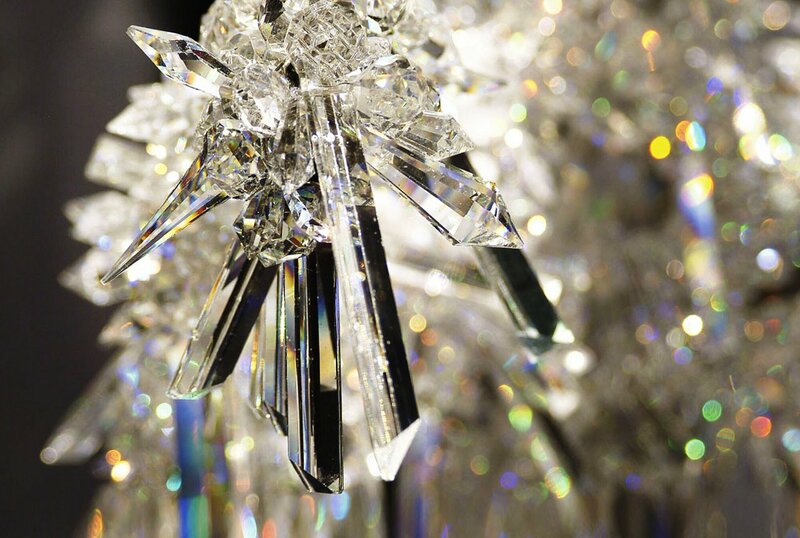 SWAROVSKI is the king of crystals. They have taken the innovative techniques of crystal cutting to the next level and beyond. The variety of crystals and products are breathtaking. If I worked there I don't think I would ever need to do mushrooms (not that I do now either but you get the point). Surrounded by so much beauty and working with something equivalent to magic dust, that must be what the chosen designers must have felt like when working with the crystals of their choice. From tangerine to smoky mauve, to rose gold to dark moss green and more, the crystals gave a different kind of life to every outfit that was created. Even though all the collections were praiseworthy I just couldn't get my mind off of the few I am showcasing here. FAHAD HUSSAYN with his Crystal inspiration being 'Dark Moss Green'. 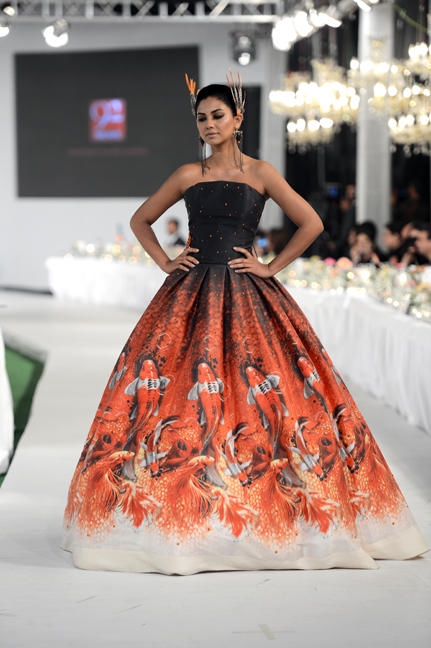 Fahad is known for his dramatic constructions and complexity, nothing defines couture better than that. The detail in not just the intricacy of the weaves or the structuring of the dress but how the crystals have been embedded in the embroidery. The over all tapestry like ensemble that looked like something out of a Dark princess' dream was something you cant get tired of admiring. This dress by KARMA was dripping with opulence. The choice of Crystals were 'Light Silk Color'. Despite the resplendence of all the layered embellishments, sequins, and crystals the outfit looks remarkably light. The palette, though more neutral, is still rich infused. I particularly like the the the layered sleeves, flowing from the shoulders to more form fitted at the wrist. The direction of the floral embellishment from the chest downwards gives great impression and movement. The dress can be worn as is or paired with simple silk straight pants for the not so daring and still look fabulous. The simple, yet striking all black ensemble from LIBAS. The choice of Crystals were 'Smoky Mauve'. The loosely ruched dress top, tricky to wear but if you can pull it off it can be your hottest number. The star spangled, literally, loose pants add that touch of glimmer required for subtle elegance. The actual beauty lies in the simplicity of the dress. However if you look closely the construction is not to simple and required great craftsmanship. NOMI ANSARI, the man who can do Couture with his eyes closed. I think he can even do it while sleeping! His bold (not surprised) choice of Crystal was 'Tangerine'. I have fallen in love with this poetic ensemble. The crisp structure of the bustier top and plump gown is broken by the fluidity of the koi effect. The entire ripple effect that was created through the print, gradient and the embedding of crystals was delightful. The elegant yet bold gown had this beautiful calmness despite the fiery palette. Perhaps it was the indirect presence of the water element. This gown was my favorite hands down from the entire collection. 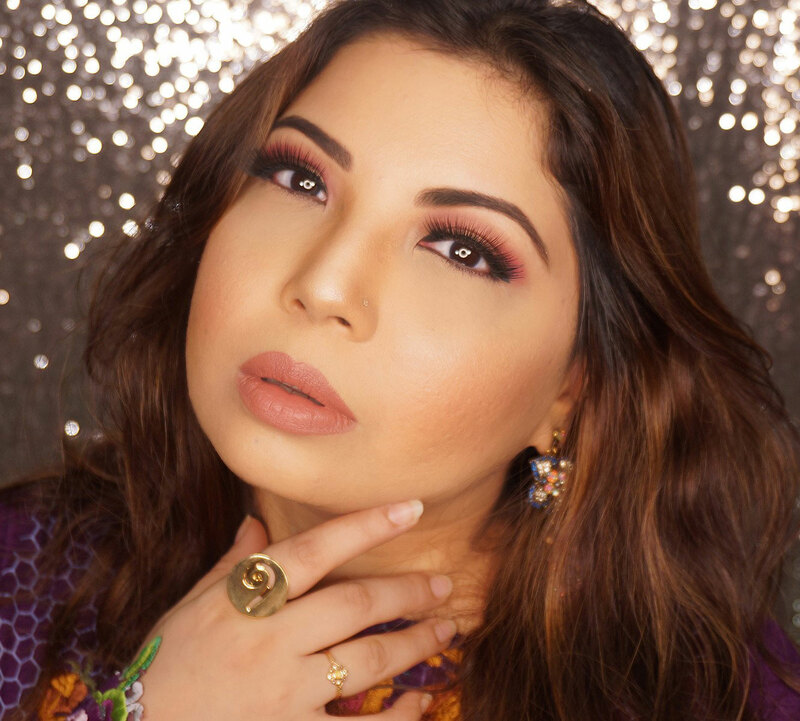 SAIRA SHAKIRA, the brand that has been making my heart skip a beat more than often these days. Their choice of Crystals was 'Paradise Shine Effect'. Sadaf Kanwal looks like a nymph out of some mythological tale in this beautiful dress. From the ribbed, crystal infused bodice, the softly falling lacy net effect, the blue grey with the soft, shimmery pastel embellishments, this dress is a treat and so much more. The tulle effect, or so I presume with lace underlay, the imagery of swans inspired by Swarovski (how could we not notice) was an elegant touch. The entire SWAROVSKI Couturier Collection was nothing less than an extravagant soiree of Crystal Elegance which I do regret missing in person. However, I do look forward to more events like this one that can seriously blow your mind away and leave you breathless. I swear I was just swoooooning over them all! Hey I am loving the new blog theme. Great post! Who doesn't love crystals? Your blog design is so unique and cool! Love it! Crystalsss *_* I love the gown by Nomi Ansari. Love that dress and wow I love crystals and everything blingy. Nice post. such exquisite pieces! <3 anything Swarovski! !